Kelsay, John 2013. Just War Thinking as a Social Practice. Ethics & International Affairs, Vol. 27, Issue. 01, p. 67. 1 This is an extension of Professor Miller's wholesale condemnation of American hegemonic power. See Miller, Richard W., Globalizing Justice: The Ethics of Poverty and Power (Oxford: Oxford University Press, 2010), esp. chap. 7. Space prevents me from responding to all the arguments he makes in this well-documented book, but suffice it to say that my differences with Professor Miller are so many and so fundamental that I would not know where to start. I sketch some replies in the second part of this essay. 2 Timothy Meier, “Taliban Demands Rigid Conformity,” Insight on the News, October 22, 2001; available at findarticles.com/p/articles/mi_m1571/is_39_17/ai_79167198/. 3 See, inter alia, Physicians for Human Rights, The Taliban's War on Women (1998); available at www.law.georgetown.edu/rossrights/docs/reports/taliban.pdf. 4 See Lomasky, Loren, “Liberalism Beyond Borders,” Social Philosophy and Policy 24 (2007), pp. 206–33. 5 As do al-Qaeda suicide bombers. 6 See the discussion below. 7 For the assessment by the United States government, see Department of State, “Afghanistan and Pakistan Stabilization Strategy,” February 2010; available at www.state.gov/documents/organization/135728.pdf; and White House, “Overview of the Afghanistan and Pakistan Annual Review,” December 16, 2010; available at photos.state.gov/libraries/unitedkingdom/164203/2010/Overview-of-Afghanistan-Pakistan-final-review.pdf. In all of these documents, the Obama administration claims that the war presents challenges but is essentially winnable. Scholars are divided on what to do in Afghanistan. Some think victory is possible. See Anthony Cordesman, “The Afghanistan Campaign: Can We Win?” Center for Strategic and International Studies Paper, July 2, 2009. This author makes the point that victory requires more, not less, resources. Others are more skeptical and counsel negotiation (although they do not go as far as Professor Miller). 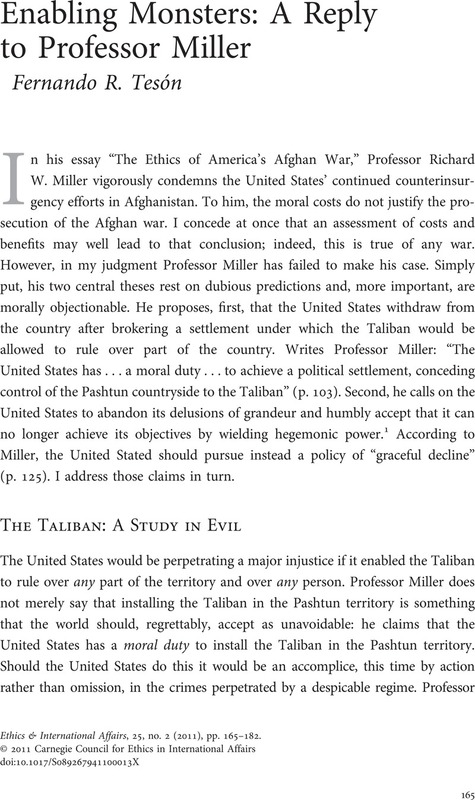 See Roberts, Adam, “Doctrine and Reality in Afghanistan,” Survival 51 (2009), pp. 29–60. 8 These documents include the 2001 Bonn Agreement, sponsored by the United Nations, and the 2006 Afghan Compact, a product of the London Conference with the participation of more than fifty nations. See U.S. Government Accountability Office, “Strategic Framework for U.S. Efforts in Afghanistan,” June 15, 2010; available at www.gao.gov/new.items/d10655r.pdf. 9 One should not allow one's approval or disapproval of the war to interfere with one's considered predictions. Let us not forget that many critics said the 1991 Gulf War was unwinnable, that the 2003 Iraq War was unwinnable, that World War II was unwinnable, and that the cold war was unwinnable. They were wrong, fortunately, every time. 10 I am aware, of course, that the central argument offered by the Obama administration is that NATO is in Afghanistan to eradicate al-Qaeda. See documents cited above. But in the achievement of that goal, NATO intends to eradicate or neutralize the Taliban. Therefore, it intends to liberate Afghanistan as a means to combat terrorism, which is itself a perfectly justified motivation. For a full discussion of intention and motive, see Tesón, Fernando R., “Ending Tyranny in Iraq,” Ethics & International Affairs 19, no. 2 (2005), p. 1. 11 See Tesón, Fernando R., Humanitarian Intervention: An Inquiry into Law and Morality, 3rd ed. (Ardsley-on Hudson, N.Y.: Transnational, 2005), pp. 76–89. 12 See the news summary of the report, released on March 9, 2011; available at unama.unmissions.org/Default.aspx?tabid=1741&ctl=Details&mid=1882&ItemID=12602. The report rightly decries the fact that not enough is being done to protect civilians. 13 See the discussion in Tesón, Humanitarian Intervention, pp. 160–64. 14 See NATO, “Afghanistan Report 2009,” p. 17; available at www.isaf.nato.int/pdf/20090331_090331_afghanistan_report_2009.pdf. 15 Ronald Dworkin, for example, recently joined the malaise chorus “[Many people] read every day of our declining power and influence. Our dollar is weak, our deficit frightening, our trade balance alarming. . . . Our requests and demands are more and more ignored in foreign capitals. . . . Our vaunted military power suddenly seems inept: we are unable to win any war anywhere. . . . The democracies of the world, who once thought us the model of the rule of law, now point to Guantánamo and Abu Ghraib and call us human rights criminals. . . . History has left exceptionalism behind: the world has, fortunately, moved beyond the capacity of any single nation to dominate the rest. If Americans do not come soon to accept that, frustration will roil our politics for a long time to come.” Ronald Dworkin, “The Historic Election,” New York Review of Books, December 9, 2010, p. 56. I am glad Americans did not listen to similar predictions in 1979, and I hope they do not listen to them now. These critics never liked American hegemony to begin with (Dworkin concedes as much in the quotation above), so it is hard to know where prediction ends and wishful thinking starts. 16 A useful summary of the debate can be found in Layne, Christopher, “The Waning of U.S. Hegemony—Myth or Reality? A Review Essay,” International Security 34, no. 1 (Summer 2009), pp. 147–72. 17 In the book he writes: “The normal interactions of American elites and the American electorate are bound to give rise to vast and morally unjustified harms, including vast harms of unjustified violence, so long as the American empire endures.” Miller, Globalizing Justice, p. 181. 18 Some means are so immoral that possibly no end may justify them. Torture may be in this category. 19 The agency costs for citizens in a democracy of supranational governance arise because those who create international norms are not elected by, or accountable to, those citizens. As a result, an international governing body may foster an international order inimical to liberal values. The idea is that citizens in a liberal society should have control over the rules under which they live, especially their liberal institutions. An example: a sizable group of governments, one that could very well dominate any supranational agency, is trying to get the international community to adopt the criminalization of blasphemy as an international norm. On March 27, 2009, The UN Human Rights Council adopted a resolution recommending the criminalization of “defamation of religions.” See ap.ohchr.org/documents/E/HRC/resolutions/A_HRC_RES_7_19.pdf. This document, fortunately, has no legal force and has been widely criticized by Western observers. See Paula Schriefer, “The Wrong Way to Combat ‘Islamophobia,’” New York Times, November 9, 2010, Op-ed section; available at www.nytimes.com/2010/11/10/opinion/10iht-edschriefer.html. 20 The literature on global public goods is abundant. For a short introduction, see Nye, Joseph S. Jr., “The American National Interest and Global Public Goods,” International Affairs 78 (2002), pp. 233–44. 21 For an attempt to apply political morality to the question of hegemony, see Brilmayer, Lea, American Hegemony: Political Morality in a One-Superpower World (New Haven, Conn.: Yale University Press, 1994). 22 See “NATO Nations Approve Civilian Casualty Guidelines,” August 6, 2010; available at www.nato.int/cps/en/SID-F7DB3D47-AE2D46F9/natolive/official_texts_65114.htm; United Nations Assistance Mission in Afghanistan, “Afghanistan Annual Report 2010: Protection of Civilians in Armed Conflict,” March 2011, esp. p. iv: “Efforts by international and Afghan military forces to reduce civilian casualties resulted in fewer civilians killed and injured by these forces in 2010 than in previous years. This is welcome particularly in the context of the surge of international forces and increased military operations in 2010.” A more critical view, with recommendations for improvement, can be found in “Nowhere to Turn: A Joint Briefing Paper by 29 Aid Organizations Working in Afghanistan for the NATO Heads of Government” (Summit, Lisbon, November 19–20, 2010); available at www.oxfam.org.uk/resources/policy/conflict_disasters/downloads/bp-nowhere-to-turn-afghanistan-191110-en.pdf. 23 True, these efforts have proven daunting, and the human rights situation has not been improved by a recent fraudulent election. For an overview, see the 2010 Freedom House Report on Afghanistan; available at www.freedomhouse.org/template.cfm?page=363&year=2010&country=7765. But no one seriously suggests that these difficulties compare unfavorably with the human rights situation under the Taliban.